This is a guest post by freelance publisher Brianna Jones. Even though women tend to dominate the nursing field, men are making it known that they can do the job just as well as women can. 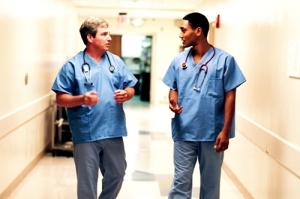 The numbers continue to rise and more men are working in nursing as the years progress. Since there is such a high demand for nursing professionals, men are doing their part to fill the role. Back in the 1970s, only 2.7 percent of nurses were men. Today, that number has tripled to 9.6 percent. Many people assume that working as a male nurse is not manly, but that is simply not the case. Most of the time, people don’t have the stomach to handle working as a nurse. Changing bedpans, bandages and moving patients from one bed to another all require a great deal of fortitude. A social stigma existed for quite some time, but that seems to be diminishing. Thanks to all of the economic benefits associated with nursing, more and more men are being attracted to the nursing field. Nursing was once a religious or military role that was filled by men. During the Civil War, men had to take part in other pursuits and the women were the ones who filled the positions. In the 1900s, the nursing schools only allowed women to enter. Men were prohibited from serving as a nurse until the Korean War was over. People feel as if men are not able to work as a nurse. They doubt their abilities because it is seen as a profession for women. As men make their presence known in the nursing field, people will start to overlook the stigma that has followed men for so long. After people have a positive experience with a male nurse, their view of men working in the field changes significantly. Even though men and women are able to work in the same positions, there are positions were men tend to work more than women. Most of the time, you will find more men working in critical care settings, emergency rooms, intensive care units and as a CRNA. Men tend to work in positions where there is a sense of urgency and calmness required. They are better suited to handle positions where people are needed who can adhere to strict guidelines. Working as a nurse allows the individual to spend time with an array of different patients on a regular basis. Nurses are able to work alongside social groups in a variety of settings. Nurses and doctors see each other as peers in the field. For those who work as a nurse, they are respected members in the profession that are able to bring a unique experience to the nursing profession. Men and women will both find that working as a nurse yields a number of fabulous opportunities unlike anything you can imagine. You can also look into completing your RN to BSN online degree once you have enough experience. Even though you might not realize it, there are a number of opportunities available for those in the nursing field. If you enjoy working in a fast-paced and challenging environment, military and critical care nurses have some of the most interesting and demanding jobs in the industry. Nurses get to take part in all of the new and improved technology released to the market. You will be doing your part to better the lives of others. One of the biggest benefits to working as a nurse is not being restricted to a set work schedule. Plenty of opportunities are available when choosing to work as a male nurse.